WE BELIEVE, that the purpose of our catechetical ministry is to proclaim authentically and fully the message of Jesus, to foster an understanding of and build community in all areas of life, and to encourage service to each other for the good of all. WE BELIEVE, that you have entrusted your children to us to deepen the Faith you have given them as parents/legal guardians. WE BELIEVE, that with your cooperation, such as, celebrating the Holy Eucharist and the Sacraments together, attending parent meetings, and daily reinforcing Christian values in your homes, we can help you, help your children grow in their faith as they journey with you. 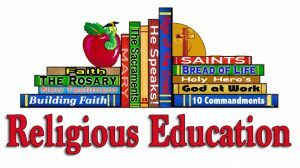 WE BELIEVE, that the goal of religious education through formation is to make us aware of the action of God in our lives, both within us and outside of us. That religious formation is faith brought to understanding. THEREFORE, we will work with you to awaken this awareness in your children and encourage them to gradually accept responsibility for their own Christian Development, as they are able. Holy Trinity Parish CCD Program seeks to reach children from kindergarten through eighth grade by proclaiming Christ’s message through instruction, prayer experiences, service projects and the sacraments of Holy Eucharist, Reconciliation and Confirmation. We realize that our ministry is accomplished in partnership with the parents/legal guardians who are the primary catechists. Together, by word and example we may lead the children on their spiritual journey and hopefully encourage and accompany them. For your convenience the office has a voice mail system in place. Please leave your name, phone number, the reason for your call and the best time to reach you. We will make every effort to return your call in a timely manner. Communicating well is important with you and your children. You may reach the Religious Education office also by email at ccdholytrinity@gmail.com . Holy Trinity Parish CCD classes are held at: James J. Hocking Center (formerly Saint Aloysius School) on Wednesday Evenings 6-7:30 p.m. Please refer to the CCD calendar link to the right. Catechists are women and men who are members of Holy Trinity Parish and have agreed to represent all of us in a specific area of ministry. In this ministry, catechists work as assistants to the parents/legal guardians who are the primary catechist. The catechist is to help, not to replace the vital role of the parents/legal guardians has as the primary catechists. It is the catechetical staff’s role to help the parents/legal guardians journey with their children as they deepen their faith and love for Christ and His Church. Each member of the Catechetical Staff that is over the age of 18 must be in full compliance of the Catholic Diocese of Youngstown Safe Environment. This means each staff member reads the Child Protection manual; completes the Child Protection workshop; and is fingerprinted and cleared through the BCI. We would like to thank all the young people and adults who volunteer their time in so many ways to help create a wonderful environment for learning, prayer, service and worship.